The bathroom suite provides a watery retreat with aqua tiles surrounded by a sea of cream and white painted shiplap stripes, reminiscent of a waterside cabana. 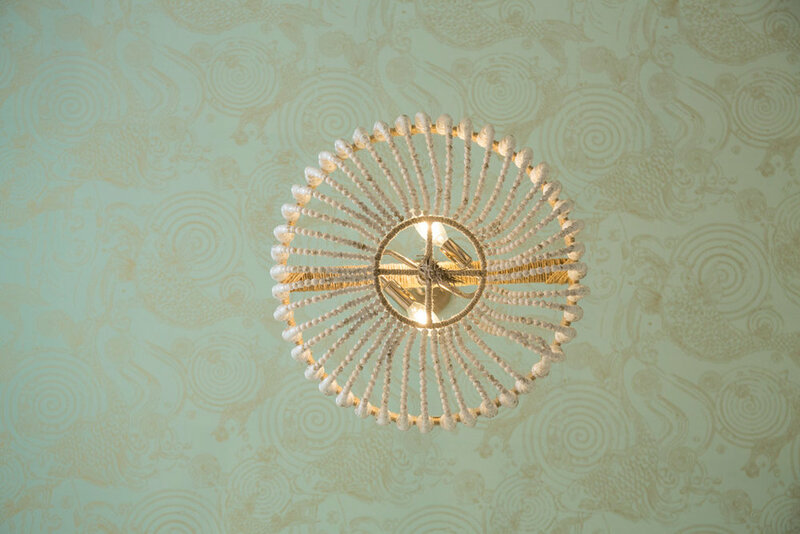 Koi swim in swirling pools on the papered ceiling around the handmade bead and rope chandelier. 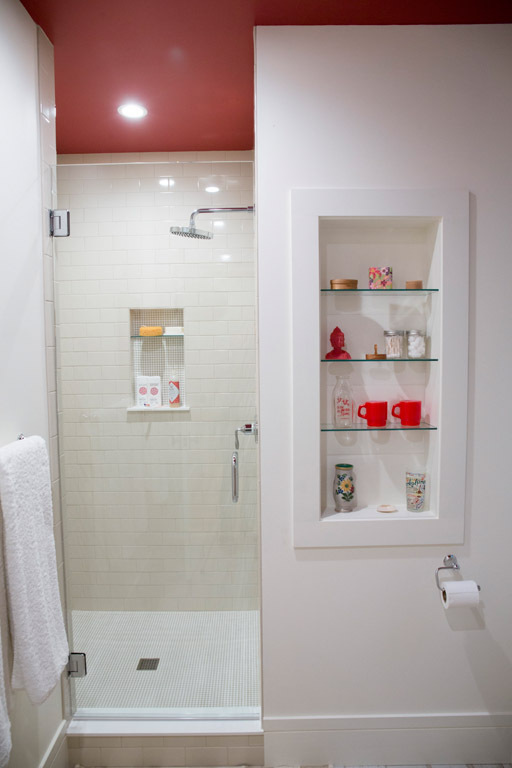 The business functions of the bathroom are separated from the central sink area to ensure privacy while still allowing for multiple occupants. We incorporated two tone painted shiplap walls into both guest suites to make sure the two distinctly different spaces remained thematically connected. 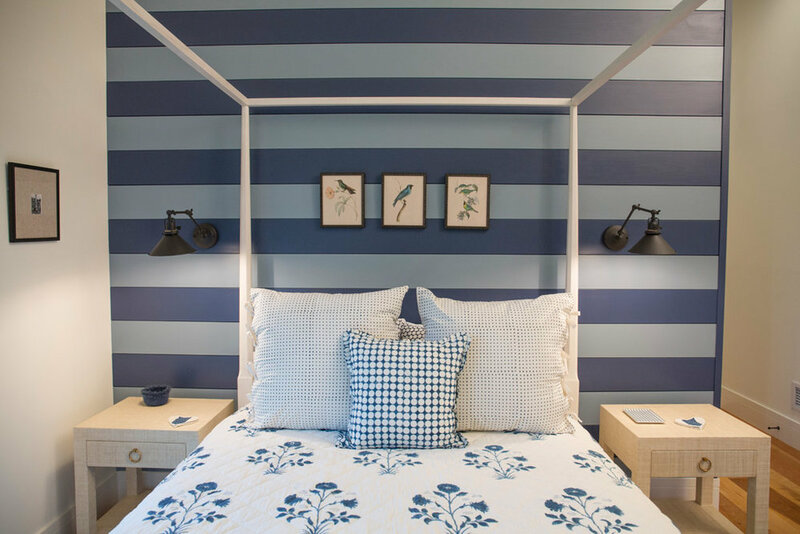 In the blue room, the navy and blue gray shiplap walls make for a crisp, lively bedroom. A cozy and perfectly pillowed window nook provides a wonderful space to curl up with a favorite novel. Vibrant red and orange hues offer a warm take on the fun stripe theme in the second guest suite. Paisley throw pillows and a quilt from our clients’ antique collection blur the lines between history and modern architecture. Sunlight pours into a lofted play space through the cupola, spilling into the bedroom below.